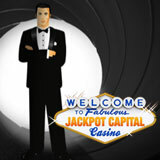 To commemorate the global launch of the latest James Bond film, Spectre, Jackpot Capital Casino "James Bonus casino bonus event" honors the world's favorite spy. Did you know that Spectre earned $83 million in its first five days when it opened in the US last week? That makes it the biggest 007 movie ever (outside the recent Pierce Brosnan and Daniel Craig blockbusters). Jackpot Capital players earn scoreboard points by playing casino games in either the online casino or the new mobile casino. During the James Bonus event, every Monday until December 7th, $16,000 will be given away as hundreds of players get bonuses up to $700 each based on how much they’ve played. Another $5000 awarded in random Gold Time Bonus draws every Friday gives everyone a chance to win. Boosting players’ accounts for the weekend can help them improve their bonus category in time for Monday morning bonusing. Jackpot Capital Casino has a wide selection of slots and table games from Realtime Gaming (RTG) including Christmas favorites like Naughty or Nice, Rudolph’s Revenge and The Naughty List, all also available in the mobile casino for phones and tablets.